Joseph Griffin opened his business in 1739 in Bond Street London, and went into partnership with Tow in 1773 to form the well known gunmakers Griffin and Tow. 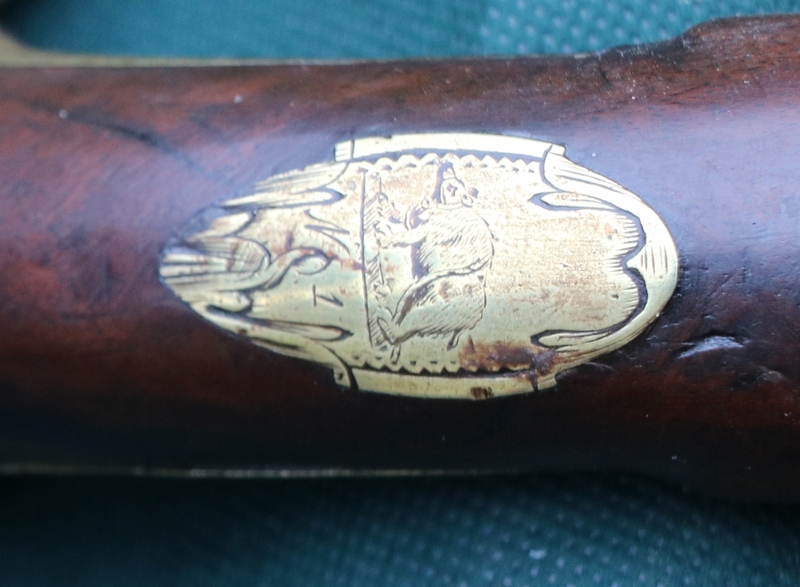 That puts a bracket on the possible date for this gun, and I would guess this was made in the middle of that period – say 1755 to 1760. Like all pistols of the period it would have been made and sold as a pair, and indeed the escutcheon has No 1 engraved on it along with a chained bear – the personal arms of the owner. The pistol is all original and conforms to the pattern seen in other Griffin Officers Pistols – it suffered extensive damage to the fore-end and that has been very skillfully repaired and is inconspicuous. I have almost exactly the same pistol, in a very similar state, that I am slowly restoring. I was going to make a completely new stock but having seen what you have done I think I will now concentrate on resurrecting the original. Glad you are going to restore it, its the right decision! Otherwise you may as well make a replica pistol from scratch! Send me a photo when you’ve done it. Gold Plating Andrews Restoration and tips.